Can you get neck pain with gout? You certainly can get gout in the neck, as you can with any joint. And that hints at one of the main problems with neck gout. How can you tell if it’s just your neck or if your back, shoulders, or your jaw are affected? And what can you do to stop neck pain from gout? Because of the location of the neck, sometimes we can’t be sure if gout symptoms are affecting joints in the spine, or nearby. Unfortunately, current mainstream medical imaging techniques cannot tell which joints are affected until the joint is permanently damaged. Sometimes a rheumatologist can locate the problem. But usually, this is impossible without surgery. Another complication is that sometimes neck pain arises from poor posture. When gout attacks, we tend to walk, stand, and sit with difficulty. Awkward posture always affects the neck. So what can we gout sufferers do to stop gouty neck pain? Most important is the need to seek medical advice and get the neck checked properly. Having gout does not exclude you from other health problems. One gout sufferer, in the forums, reported that a scan revealed damaged joints. There are many potential causes of sore joints in the neck. Gout is one of many potential problems, so you must let the experts check you. Another sufferer proved, at least to his own satisfaction, that the neck pain he had experienced was due to gout. He took the wise step of starting allopurinol to lower uric acid. After a few months, the pain in his neck ceased. This is perhaps the best solution, but make sure your allopurinol dose is enough to lower uric acid to 5mg/dL (0.30mmol/L). A few months below that gives you your best chance of dissolving old uric acid crystals quickly. Compared to some topics, only a small number of people have reported neck problems in the gout symptoms forum. My own research confirms that incidence of neck gout is low. The small number of cases I have seen reported appear to focus on tophi, rather than the progressive nature of gout affecting every joint. However, at least one study notes the pervasive nature of spinal gout reaching the neck . My search for cases of neck gout revealed gout in several unusual places. One unexpected report turned up because it referred to the “femoral neck”. That is the joint at the top of the thigh bone, and we have discussed gout in the hip several times. This report is particularly interesting as it reminds me of some scary, permanent mobility problems associated with untreated gout. I will cover other joints I have encountered during this research, in separate articles. If you have had gout pain in your neck, please share your experiences in the Gout Symptoms Forum. 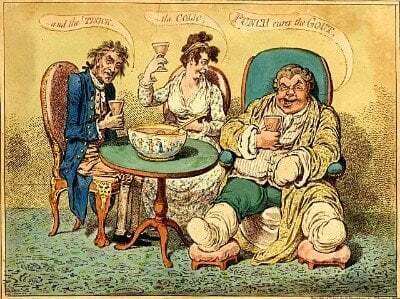 If you have experienced gout in other joints, please start a new topic in that gout symptoms forum, or wait for my next article about gout and other sore joints. Leave Neck Pain With Gout to browse the Gout Symptoms guidelines. Publisher: British Journal of Radiology (2006) 79, 537-539. Title: Neck pain: an unusual presentation of a common disease. Authors: A C Pankhania, MBChB, MRCS, T Patankar, MBChB, DMRD, DMRE, DNBE, FRCR and D Du Plessis, MRCPath.